Web optimization frameworks include two defaults transform type JsMinify and CssMinify which is used by ScriptBundle and StyleBundle respectively. However we can create our own custom transform type to processe references as per our need. To create custom transform type, we need to create class which implements IBundleTransform interface. IBundleTransform interface define a method named Process which process bundle response. In developer preview version, Process method had only one parameter of type BundleResponse, however onwards RC release, Process method introduced one more parameter of type BundleContext. In this post, we will see how we can utilize this additional parameter while creating our custom transform type. As name suggest, with BundleContext, we can get information about bundles which could include existing bundle information, bundle url, HTTP context for bundle, etc. Following is the list of all property of BundleContext. - BundleContext.BundleCollection : We can get collection of all bundles including default and custom bundle in application through this property. - BundleContext.BundleVirtualPath : This property expose virtual bundle url i.e. ~/bundles/MyBundle. - BundleContext.HttpContext : This property is type of HttpContextBase, and we can have access of HTTP context through this property. This is very much useful property when we are creating transform type which generate dynamic response. For e.g. we can access query string parameter passed to bundle url (~/bundles/MyBundle?id=123) through this property (context.HttpContext.Request.QueryString["id"]) and we can use it to create dynamic bundle response. - BundleContext.UseServerCache : Default value of this property is true. It means only first request to bundle url will be intercepted by transform types and once response is generated it will be stored in server cache and further request to bundle url will be served from server cache without processing it. This will help to reduce bundle processing time and to increase performance. If we set BundleContext.UseServerCache to false then all request will be processed by transform type this is only necessary when bundle url are generating dynamic response. See detailed walkthrough later in this post showing how to use this property in accordance with BundleResponse.Cacheability. - BundleContext.EnableInstrumentation : Default value of this property is false. This is used for tracing and analysis purpose. We can check value of this property and can write tracing code accordingly. We can also set true to this property to enable instrumentation for further lifecycle of Web optimization frameworks for current bundle request. BundleResponse is used to retrieve list of files included in bundle so we can process it and generate response for bundle. As BundleResponse is used to generate response of bundles, it needs to take care of two primary properties of generated response. 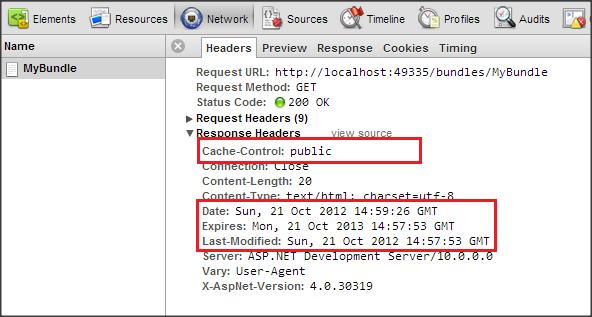 One is response content type and another one is HTTP Cache-Control header. So BundleResponse also expose properties for the same. 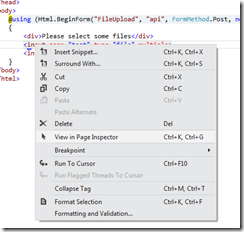 Following is the list of all properties in BundleResponse class. - BundleResponse.Files : This is IEnumerable collection of files which is included in bundle. We can iterate through this collection and process file content to generate bundle response. - BundleResponse.ContentType : Through this property, we can set content type for bundle so that browser can render it appropriately. Default content type "text/html". - BundleResponse.Cacheability : We can use this property to set Cache-Control HTTP header of bundled response. Default value of this property is Public. - BundleResponse.Content : Anything which we set as a value of this property, that content will be sent back to browser as a response of bundle. 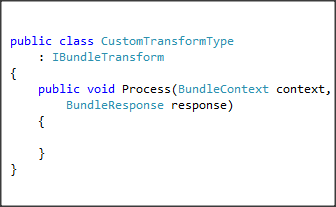 Following is the complete code which shows how to create custom transform type and how we can use it with bundling. As we noted earlier, we can set BundleContext.UseServerCache to false in order to process all bundle request and generate dynamic response. Let try to simulate this by small walkthrough and see it works or we need to take care any additional parameter. As we can see, it seems (read again it seems) it is processing bundle response only first time for separate client (is it really? nop). Nop this is not the case. In fact this is how client deals with it due to HTTP cache control header. Confused? See response header of bundle url to get more information. As we noted earlier default value of BundleResponse.Cacheability is Public. So even if we have set BundleContext.UseServerCache to false then also due to Expires response header and Public Cache-Control header client is not sending request back to server. So in this case we need to also set BundleResponse.Cacheability to NoCache. We can also set it to Private but in some client we need to press Ctrl + F5 to refresh bundle response. After setting BundleResponse.Cacheability to NoCache try to refresh bundle url again now it is re generating bundle response on each request. 1. Create a new MVC project called "MySignalR" ( either 3 or 4, and either an empty project or a templated project ). I will choose the Empty project for mine. 6. Create a new Empty Controller in your Controllers folder and name it "Home". This will generate the "Index" ActionResult, so then right click on the word "View();" and select "Add View" making sure that you have "User a layout or master page:" selected. Once you have mastered the basics, you can then look into sending messages from the Hub to only the person requesting the data, or groups of users. Hope you enjoy the tutorial. You can apply this new features. Find more about ASP.NET MVC 4 hosting on HostForLIFE.eu. One of the features of this so called killer app will be to upload pictures (nothing special I agree). But how would I do this for all the clients I hope to support (WinRT/WP7/Html5/IOS). Let me first present the server that will be used for all these clients, I’ll then follow up with what I consider to be the simplest client a html5 browser! So I fired up VS11 and created a new MVC4 application using .net 4.5 / C# and the WebApi template. You can see from line 12 that I’ve made this operation async, you’ve really got to admire the simplicity of async/await construct in .net 4.5! In line 22 you can see that the compiler and some state machine magic allow the freeing up of the asp worker thread…..
and we’re done! Of course in the real world we’ll use ajax with a few trick re sandbox, but here’s the response in the browser with xml. I’ll hopefully follow up with the samples for the client list below when I get to the respective development machines. Oracle provide MySql ASP.Net web providers through NuGet – search for MySql.Web. Using the MySql providers you can easily use MySql as your membership/profile/role backend for an ASP.Net application. I am going to demonstrate using it as the membership provider for an MVC 4 application using Razor but the steps are almost identical for the ASPX views. 4 <add name="MySqlMembershipProvider" type="MySql.Web.Security.MySQLMembershipProvider, MySql.Web, Version=6.5.4.0, PublicKeyToken=c5687fc88969c44d"
Obviously you also need to configure a valid MySql connection string, create a MySql schema, change any other security settings you want and put the name of your connection string into the provider configuration but your on your own doing that. Once you have the initial setup done open the ASP.Net configuration website (VS2012: Project menu -> ASP.NET Configuration – at the bottom of the menu) and create a user in the security tab. Doing this will create the database structure and a new user providing you have set the configuration up correctly. This is a simple fix for getting MySql up and running. Basically we just rollback the AccountController to use the old style MembershipProvider which is supported by the MySql MembershipProvider. This won’t support OAuth authentication but will get your MySql Membership provider up and running with ASP.Net 4.5 and MVC 4. If you want to directly create the membership data structure without using the ASP.NET configuration tools use the following SQL as a base and modify SCHEMA_NAME and collation to be what you require.